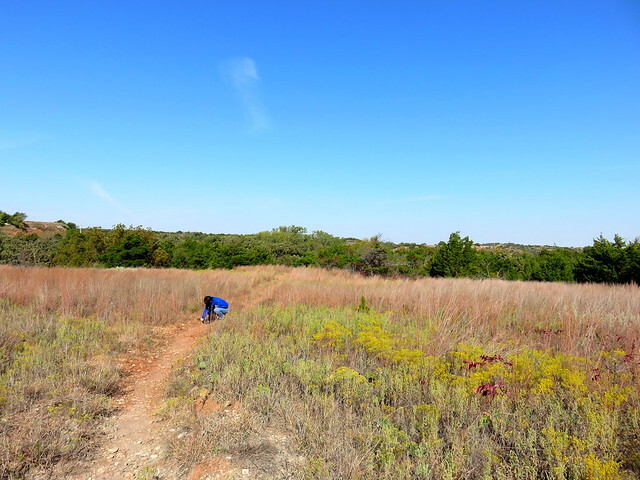 For the weekend of Fall Break 2015, Wendy and I stayed and hiked at Roman Nose State Park at Watonga, with a stop along the way to see my folks in Oklahoma City. 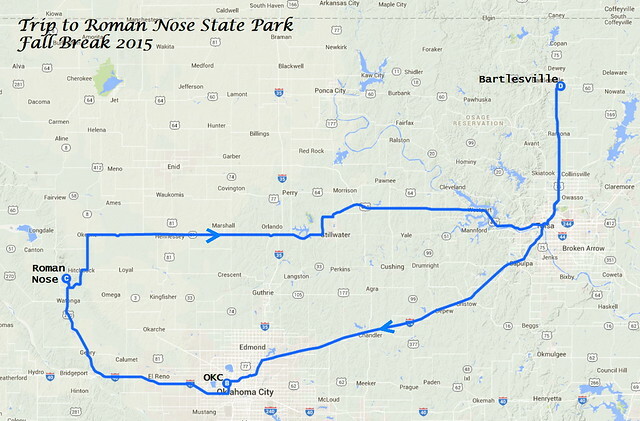 I last visited Roman Nose five years ago, circumnavigating the park which I remembered from my youth. I wanted to show it to Wendy, not least because I figured she would enjoy the rocks along the trail. 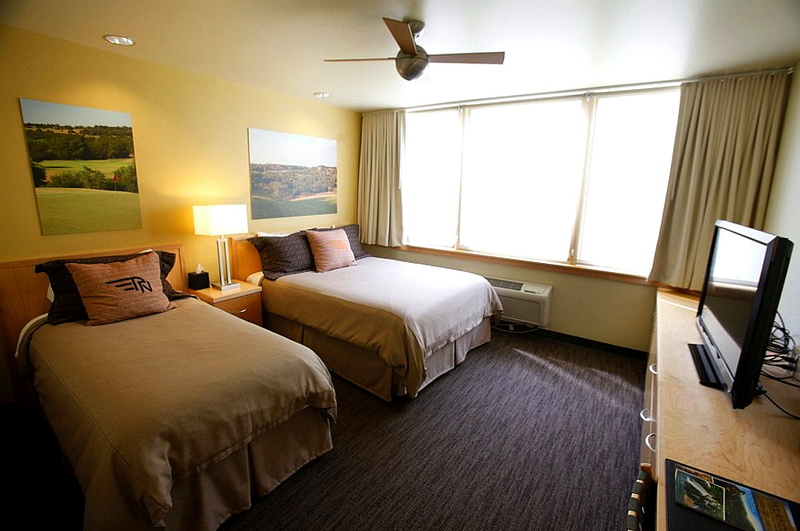 This time, however, we would stay at the lodge, which had a $5.1 million renovation between 2007 and 2011. I last stayed there back in the early 1980s, when my friend Jeff and I got so cold at our campsite that we gave up and rented one of the small rooms at the lodge. Wendy has made it clear to me that camping is not in our future, and, frankly, I don’t mind leaving my tent unused up in the closet. We spent much of Saturday in Oklahoma City, visiting my parents. They treated us to lunch at Swadley’s, a BBQ joint, and then I set up my old TiVo Series 3 to replace theirs, which was crashing frequently. Later it turned out my efforts were in vain, as my old TiVo kept crashing as well. So they are giving up on the venerable TiVos and seeing if they can cope with only live broadcast HDTV for awhile. Wendy and I departed west along I-40 and then angled northwest to Watonga, where a few miles to the north the Roman Nose canyon nestles in the Gypsum Hills. We drove to the lodge and checked in. The renovations are respectful of the lodge’s original mid-century style. I prefer National Park Service rustic over Mid-Century Modern for park lodges, but in this case it probably made sense to stay true to the lodge’s origins, with some much-needed improvements. 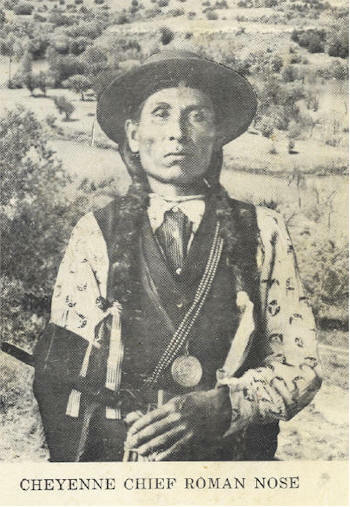 The 1956-era entry used to be truly pathetic, except for the large head of Chief Roman Nose, and the lodge had several poor additions over the years, with some falling into disrepair. Studio Architecture created a dramatic raised entry for the registration area. That leads to a high and large room used as both lounge and dining room. 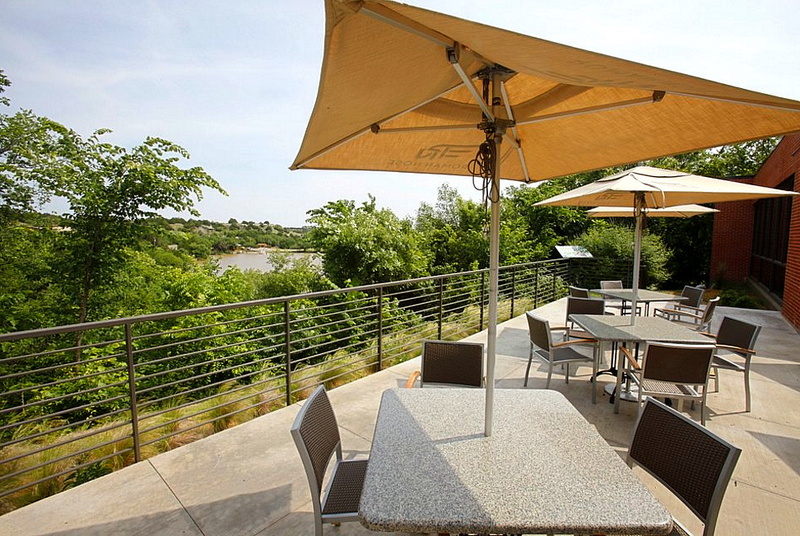 A patio at the end of the dining room invites you outside for a glimpse of the lake. I think some trees should be taken out to improve the view; a high shot shows it has more potential. The row of 22 small rooms is off to the side. 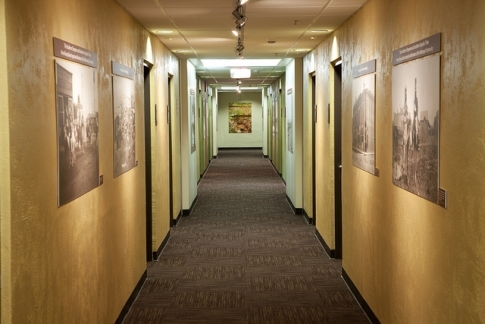 The hallway now features lots of nice historic photos of the park’s construction. The rooms are necessarily small, due to the original construction, and you have to choose between a king size bed or a queen with a single. 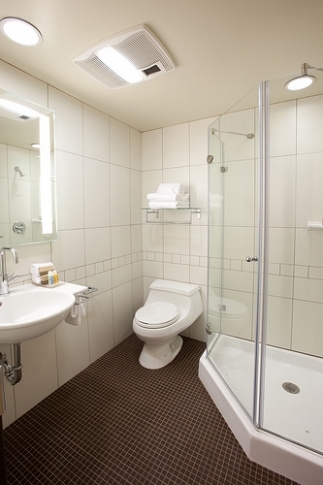 The restroom is too small for a tub, so it only has a shower. 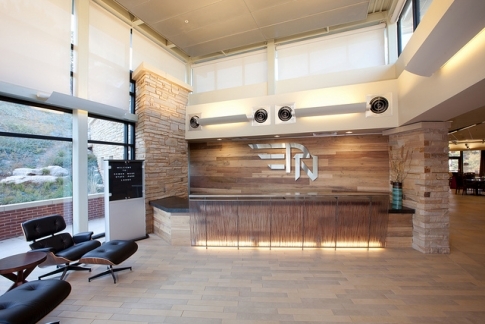 But the colors, fabrics, and finishes are carefully chosen, often featuring a fancy new RN logo. We arrived at Roman Nose in the early evening. After checking in and relaxing in our room, we decided that we didn’t want a late night meal in the lodge restaurant. Instead, we drove south to the north edge of Watonga to pick up some things at a Wal-Mart Neighborhood Market. The moon was out, and the lodge entrance was lit nicely upon our return. Sunday morning breakfast at the lodge was buffet only. I didn’t care for it that much, but it was fuel for our trek. We headed out across the long bridge that leads across the ravine separating the lodge area from the trails. The trail intersections are not always clearly marked, but this important one to take you back to the lodge had a marker I would appreciate later. The state website has an online map of the park’s trails. Wendy wanted some elevation changes for this hike, so I steered us south along the Black Loop Trail at the south end of the park. Another nice feature of that trail is that, unlike most of the other trails, it bans horses and thus their manure. The trails take you down into the Blaine Formation at the park, with its layers of gypsum. This area was under an inland sea over 220 million years ago, and when the sea water evaporated, it left behind thick deposits of salt, gypsum, anhydrite, or dolomite. 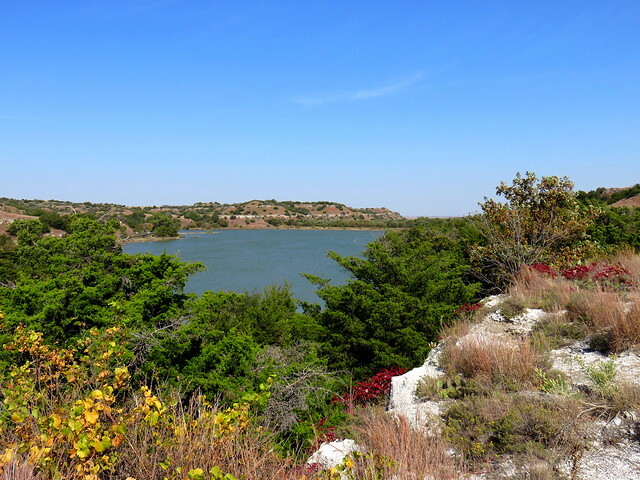 You can get all of the details about the park’s geology, botany, zoology, and early history via an online copy of the 1959 guidebook for the park published by the Oklahoma Geological Survey. As soon as we started walking across the exposed gypsum layers, memories from my youth began trickling back. Some memories are more welcome than others. The sight of prickly pear cacti reminded me of when my friend Jeff and I went bushwhacking down a hillside here decades ago to take a shortcut, paying for it with plenty of cactus needles. The different layers of gypsum and other deposits erode in interesting ways, and the glinting layers had Wendy the rock hound sniffing out pretty rocks all along the trail. We caught a peek of the adjacent golf course. 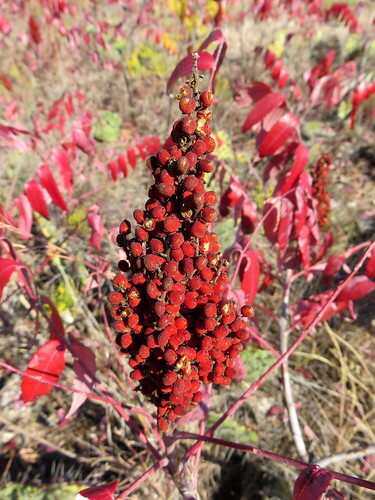 There were some blooms along the trail with autumnal colors and a plant with big clumps of red berries. I’m no botanist, so I’ll leave the identification to others, but I could easily identify the prickly pears! A welcome sign directed us to the Switch Back Trail, which I suppose is what the state webpage on these trails calls the Black Loop Trail; the online map notes the switchback, but they need to get their act together on this. As an aside, at this time my Google Chrome browser refuses to open the +More sections on the state website’s descriptions and often won’t follow links. I have to load the site in, gasp, Internet Explorer to get it to work. I don’t know if this is due to yet another annoying Google edict to terminate support for some old web code, but it is certainly annoying. The views we began to get across the canyon were anything but annoying. Wendy and I both noted deposits on the trail which resembled the cross-sections of a bone. We began to see more plants with long, droopy, red leaves. 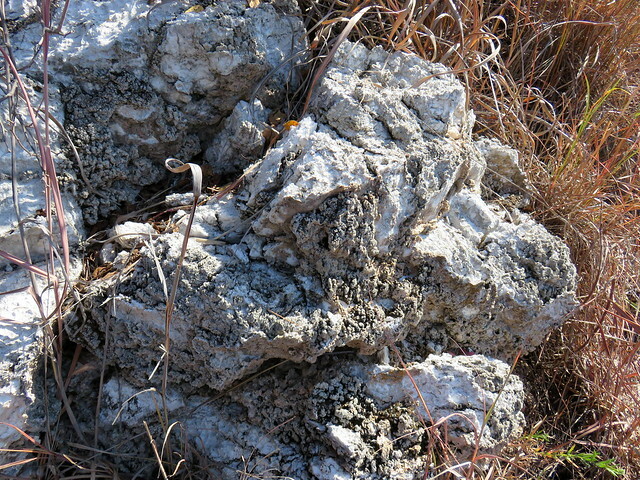 It was fun to climb up layers of gypsum deposits. We saw vertical columns which might have been the sides of the bone-like deposits. I really liked a set of pink blooms that had long strands erupting from their pistils. We’d started the hike wearing jackets, but it was warming into the 70s and we were grateful for the shade when the trail climbed into some cedars. 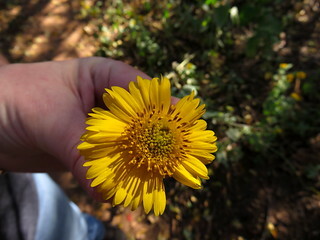 We passed yellow flowers, and a flowering plant with striking white and green striped leaves. We saw better exposed layers of the white minerals amidst the red oxide soil one associates with much of central Oklahoma. Across the canyon we could see how thick some of the white mineral layers got. 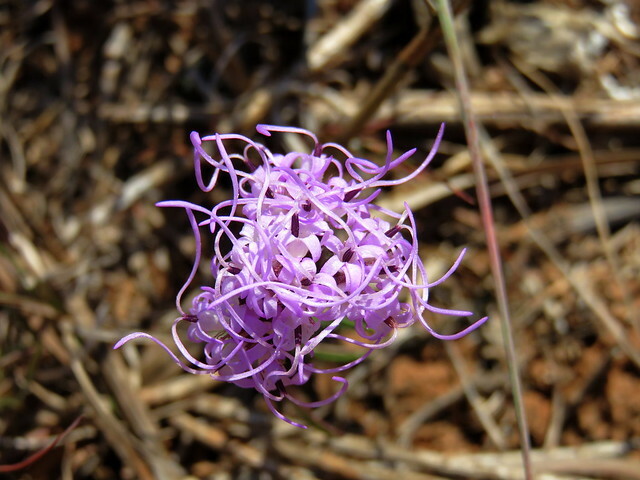 The trail zigzagged through boulders of eroding minerals, and we admired more flowers, tangled blooms, and cedar berries. The trail provided an expansive panorama as it zigzagged along the edge of the canyon. We were headed back north toward the lodge and took the opportunity to walk the canyon loop. Despite the rising heat, we opted to take the loop for high views of muddy Lake Boecher and the larger Lake Watonga. 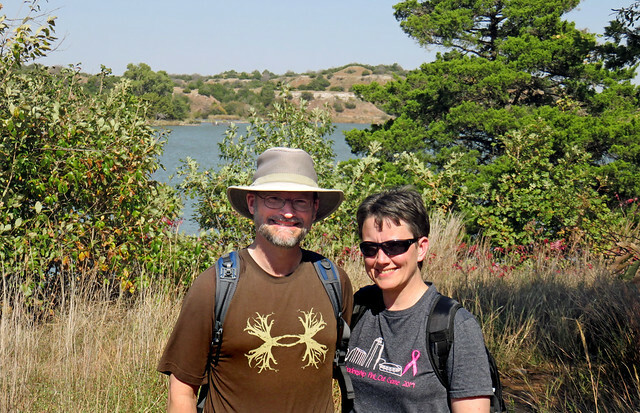 We walked down to the hidden side outlet where Lake Boecher feeds into Lake Watonga. A father and son were in a tiny boat fishing in the lake near that outlet’s small waterfall. As we approached the end of our trek, we traded shots with another couple before climbing back to the lodge. We cleaned up and had lunch; my burger was quite tasty. 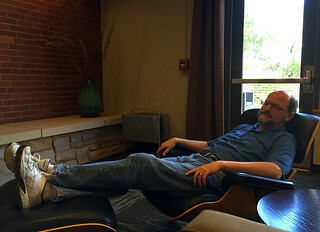 Then I enjoyed relaxing in the nearby Eames Lounge Chair. For our trip home, I drove north through Hitchcock to Okeene and then west through the grasslands to Stillwater, to take the Cimarron Turnpike through the hilly cross timbers of Keystone Lake to Tulsa, and then north to B’ville. Roman Nose was a great conclusion to a much-needed Fall Break. Wendy and I would make one more outing before Thanksgiving, spending other days building a new raised bed in the backyard for her Social Climber rose. Our next big trip will be a stay at the renovated Queen Wilhelmina Lodge atop Arkansas’ Rich Mountain in late November. An interesting take on Roman Nose. 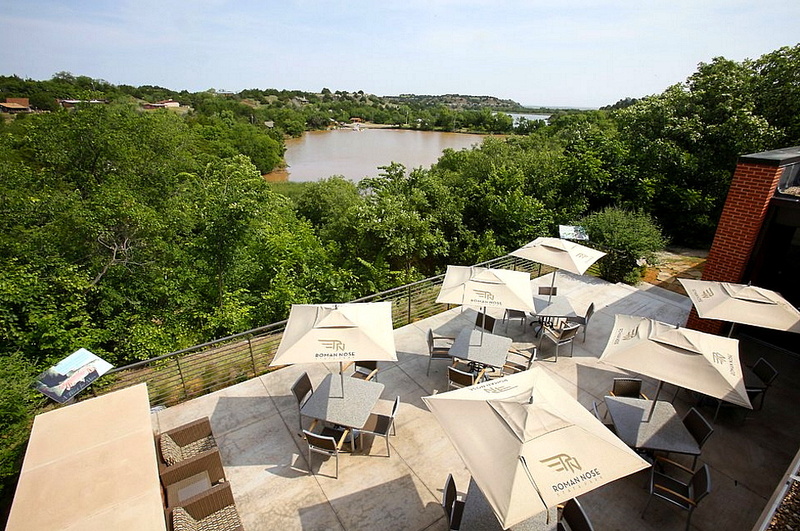 I worked at Roman Nose while in high school and then through college. My family–which includes several of your former students–is gathering there for Thanksgiving. 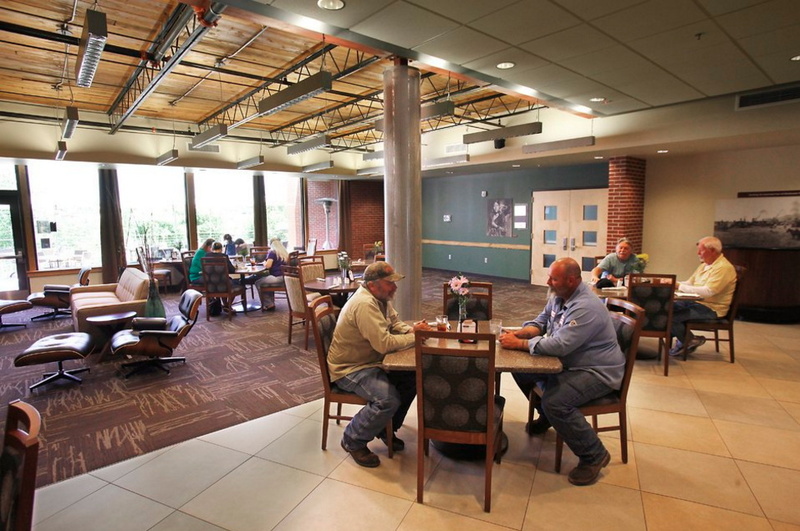 The lodge has undergone many transformations during the years. The park was build during the WPA era and has much local history. I too have enjoyed time in the Eames chair and many a fire in the rock fireplace. An Eames chair and a rock fireplace are now in my home in Texas. Small world. You really can’t beat that combination!